Fashion | Beauty | Body Positivity | Lifestyle | Pop Culture: Make A Statement! Here’s a fact- I love, love, L.♥.V.E statement necklace. We go way back and it is one of my oldest and best relationships. Along with being my plus one on may ocassions, they never become too tight for me and can perfectly complement my not-so-skinny body type. Plus, I have never once heard a jewellery sales person saying “sorry Ma'am we don't keep them in your size ”. I don't know about the rest of the world, but here in India, statement necklace is always in fashion. Last but not the least, they have the potential to make an outfit go from blah to wah in 60 seconds! (Last week, I repeated the same outfit to three different wedding while pairing it each time with different necklace. True Story). Since most of us at one time or the other has worn or styled a statement necklace, I decided to a piece highlighting the different types of statement necklaces available. A huge variety to choose from-length, shape, colour, texture, material, style- here are a few pieces that caught my attention! As much as I love this kind of body adornment and bauble, not everyone is a fan of statement necklace. And honestly, these babies are not for those who don't like the attention. The reason they are called 'statement necklace' is because they make a style statement! And nothing says all-eyes-on-me quite like a spectacular statement neckpiece. 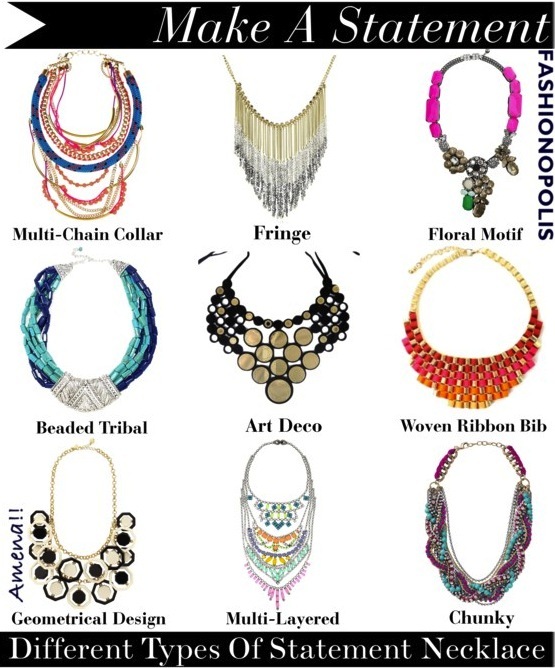 Whether you like chunky or fringy, neon infused or tribal inspired, there is a statement necklace to grace every neck. Check out how our fave fashion ladies are styling their statement necklace. Lets face it-we all repeat our outfits. Sometimes twice in a week. 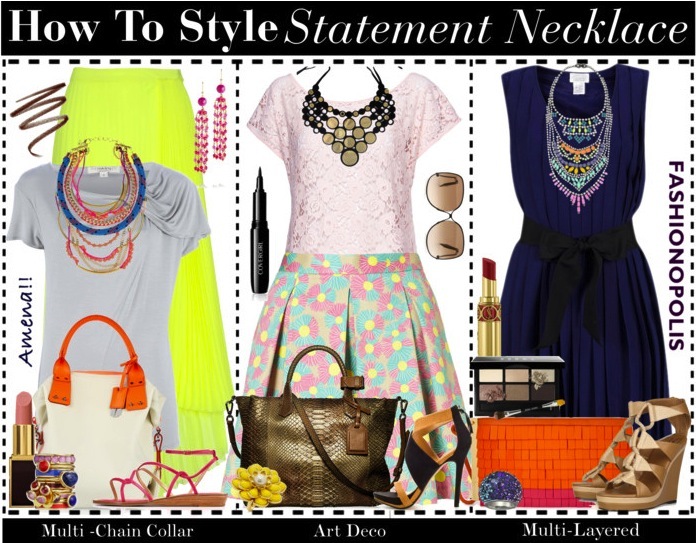 One of the best ways to make a repeated outfit look fresh is by adding a statement necklace to your ensemble. This miraculously won't make your outfit look completely anew, but it will add elements of freshness and render a different look from the previous one. II. Transforms A.M. to P.M. in Minutes. There are day when you need to go straight from corporate meeting to cocktail gathering. With no time to make wardrobe changes, statement necklace lets you improvise your A.M. look to a P.M. setting. Just throw on a statement neck piece, add a bold lipstick shade and let loose the day bun and you are all set to enjoy your appletinis. Just like our white shirt and LBD, statement necklace too, can never really go out of style. It is an essential piece of formal Indian attire and can be incorporated with most western looks as well. Like your classic jeans, the same necklace can be worn for years and not look dated. Plus, one never really has to fear (physically) outgrowing it! F.Y.I: Even though statement necklace is the focal point of the outfit, one does not have to dress in neutral shades only to make the look work. You can easily pair your necklace with bright colours or bold prints. 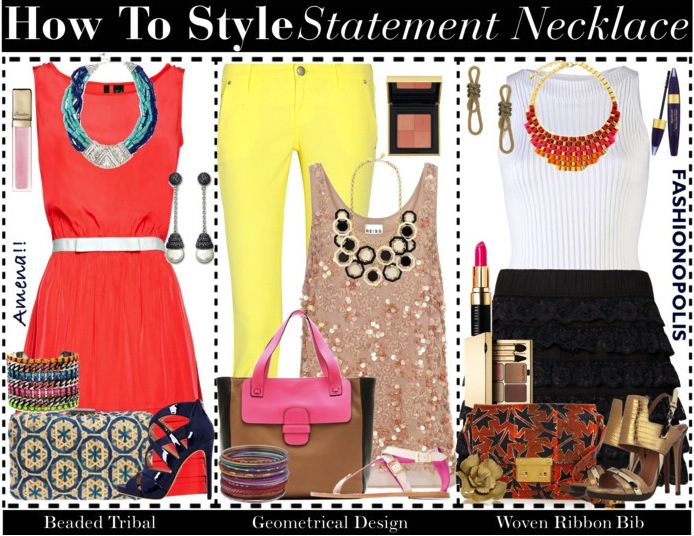 With unlimited styling option, here are my suggestions on how to style different types of statement necklace. 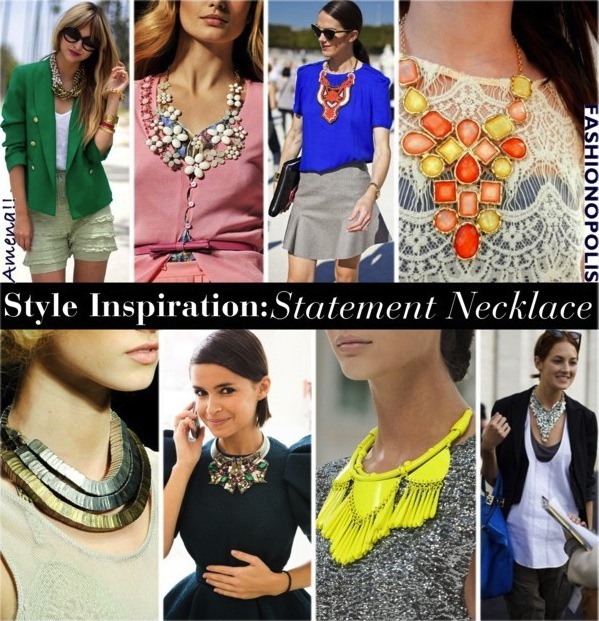 Are you a statement necklace kinda girl like me? And what style is your fave? Share your picks and views with me in the comment section. Great post. I love all your sets.. Very cute!!! Totally agree! Statement necklaces are my favorite too! Great sets...left me drooling !! They are an asset to every female being.I love how they transform the most boring look into an interesting one. Got you girl. Finally found your blog & now you are tempting me to for some fashion shopping for a change :). Lovely blog. Good Luck! 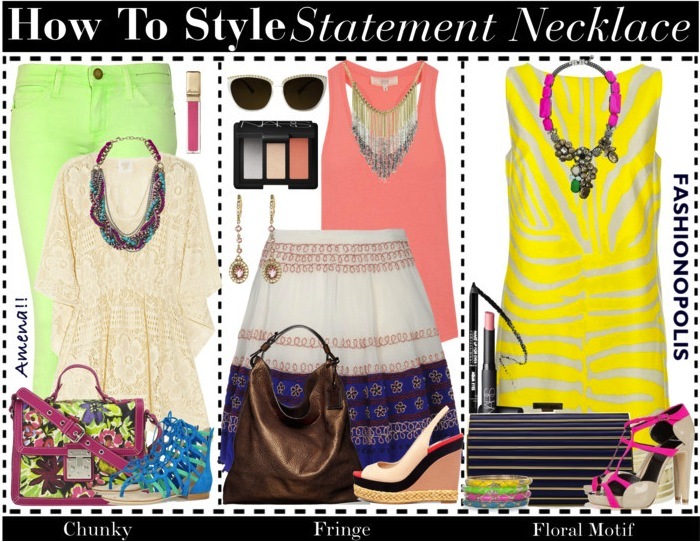 Awesome guide to wearing statement necklaces.. I'd never dared to try..statement ear rings were my thing..thanks for enlightening me :)am following ur blog for more such inspiration now.. I love this post. My trend of the week is statement necklaces as well. I love your tips and all of your looks too. I will definitely be back to visit! I love a statement necklace! Fabulous looks! I love statement necklaces too! but kinda partial to statement rings! I adore statement necklaces. So I loved this post. Also the DIY ones. <3 Liked the way you've styled them too. I like the art deco statement necklaces. It's kind of funny because I was just introduced to your blog a few hours ago, and I've just posted something about statement necklaces as well. Really like your post though! I'm a HUGE fan of statement necklaces - the key is keeping everything else pretty understated - I like what you have done with some of these examples! My weekly target is also about "Make Statement", "Wear the trend". And I found this blog very useful for me. You know I want them all!!! Great post! Love the outfits which you put together!